Renovation Priorities | Fix It! We have a lot of our clients asking us the same question: how many renovations will make the most difference. Common wisdom says that renovating the kitchen and the bathroom have the greatest impact on the value of your home, but it’s not always about that. Major kitchen & bathroom renovations can be costly, and sometimes minor renovations can make a really big impact. If your goal is to increase your own enjoyment, you might find that a small renovation is all you need. Updating tiles in either room is a great option and simply changing the vanity can change the whole look and feel of a bathroom. These aren’t necessarily cheap options but they are a lot less expensive and disruptive than a full reno. Some kitchens don’t have backsplashes at all, so adding a new one makes a huge change. Adding bright colours to a kitchen is a popular choice. 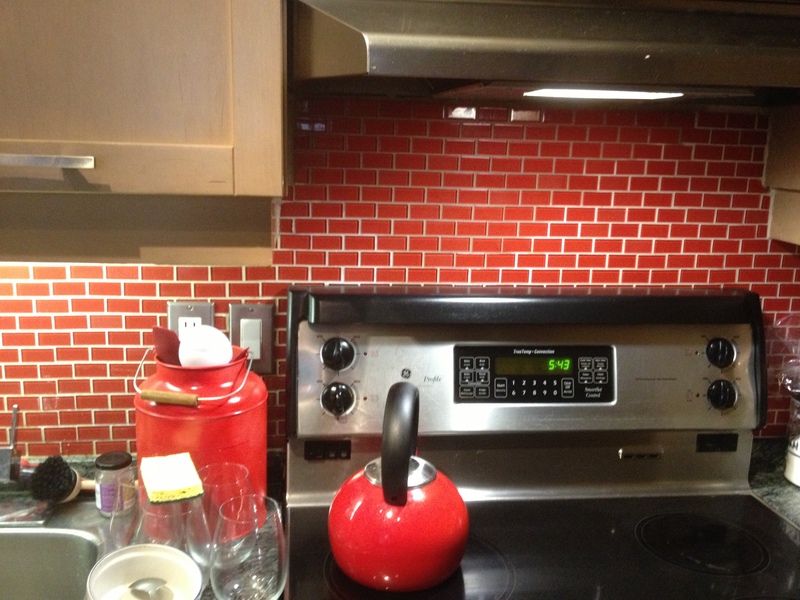 We have a client who has all of her counter top accessories the same colour as her bright red backsplash which makes it really pop! It is a focal point of her modern condo. This is particularly powerful in open-concept homes.